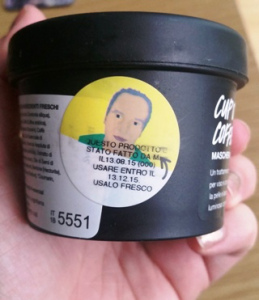 By far the creepiest Lush sticker I've ever seen. Look at his dead little eyes! My biggest problem with Frank scrubs is that they're dry, so no matter how hard you try and fight it, a portion of the scrub is going to fall into the bottom of your bathtub. Cup O Coffee is nice and thick, so you can apply it without losing any of the product on the floor. I picked up the 100g tub, and it lasts for a massive three months! I have a nasty habit of putting my face masks in the fridge, forgetting about them, and letting them go all mouldy for a week or so after the use by date. This face and body mask does not need to be stored in the fridge, so it sits by my bathroom mirror, reminding me to use it. 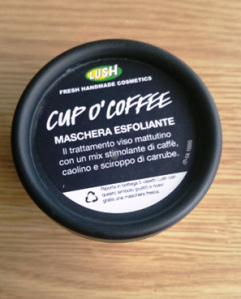 When you first open the tub, the mask itself certainly doesn't look very appealing. 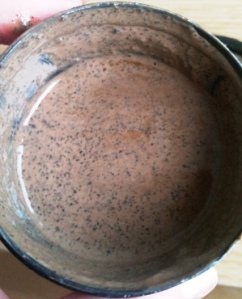 It looks like a muddy paste, with little tiny coffee grounds mashed in. The coffee is (obviously) the dominant scent, but you can smell a hint of vanilla and chocolate to round out the bitter aroma of the coffee. I've been using this mask on my face only, once a week for about six weeks now, and my skin looks a lot brighter and my skin tone is definitely a lot more even. I have combination oily skin, and suffer with frequent breakouts. I normally use Love Lettuce, which I adore, but Cup O Coffee has been a nice addition to my skin care regimen. Apply it generously and leave for 10-15 minutes. It takes a fair bit of effort to get it all off, but exfoliates beautifully. My skin feels instantly rejuvenated and I'm in a much better mood than when I started. I've been recommending this to anyone that will listen. It retails for £6.75 for 125g or £12.25 for 325g. Go try it!